Musician B.B. King speaks during the 51st Annual Grammy Awards held at the Staples Center in Los Angeles. 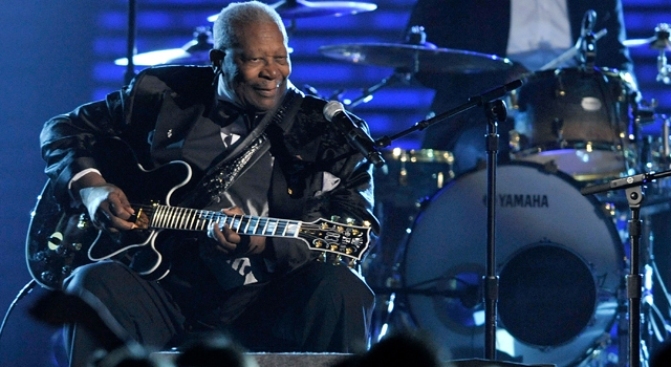 Universally hailed as the reigning king of the blues, the legendary BB King is without a doubt the single most important electric guitarist of the last half century. And he will play the new and improved Fox Theatre, 1807 Telegraph Ave. in Oakland, on Thursday at 8 p.m.
King will be joined on stage by Lukas & The Promise of the Real. And of course like any good show it is already sold out. But fret not, if you have cash that is and are immune to the economy. Tickets are being resold via Stub Hub. The only problem is they cost a pretty penny. If you still can't get to the show, we will have a photographer there catching everything.